Want to learn about leprechaun traps and tricks? Check out our three e-books that can be read on ipads. These read-aloud stories chronicle the Leprechaun adventures our family has had the last three years. Leprechaun Tricks will help introduce the story and fun to your kids. How to Set a Leprechaun Trap includes a variety of more sophisticated traps and sneakier tricks, such as the time our chickens’ toenails were painted red, as well as ideas that could spread the fun to your child’s school. Leprechauns in the Garden, shares bold interactive ideas that are sure to bring giggles and excitement for your little ones, such as the gifts the leprechauns left in our garden and the tea party they left in our kitchen. Please help spread the word, especially to parents of young kids. The intended audience is preschool – third grade but older kids would enjoy it as well. I’ve heard that even grandparents got a chuckle! This is the first of several books documenting the leprechaun mischief that has occurred in Isabella and Luca’s house each March. 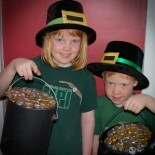 The week leading up to St. Patricks’ Day in March 2010, Isabella and Luca discover evidence of leprechauns in their home. After a few days of mischief, they decide to set some traps. Do they catch the leprechauns? Find out in this sweet 20 page story, documented by the actual photos of mischief that occurred. This sequel to Leprechaun Tricks shows what happened the two weeks leading up to St. Patricks’ Day in the the Aucello household, March 2011. Once again, there is evidence of leprechaun mischief in their home. Isabella and Luca are older and wiser, and their traps are more creative, but will they catch the wily leprechauns? Find out in this cute photo documentary story for kids, by kids. Almost 40 pages of photographs, tricks, and treats. This is the third in a series of books chronicling the leprechaun mischief in the Aucello household. For the past three years, Isabella and Luca have tried to catch the leprechauns that play mischievous tricks on them in the weeks before St. Patrick’s Day. This year the kids try a different tactic – they build a leprechaun playground! Perhaps that will put an end to the tricks and result in more treats. Will the kids have to resort to traps? 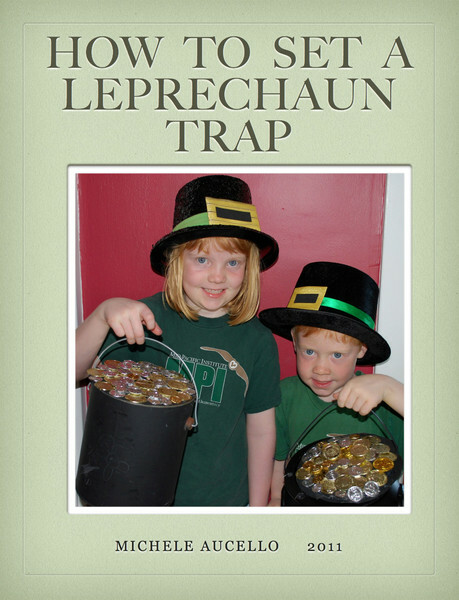 Find out in this sequel to Leprechaun Tricks and How to Set a Leprechaun Trap. Over fifty pages of photographs chronicling the leprechaun adventures. Isabella’s glue trap. 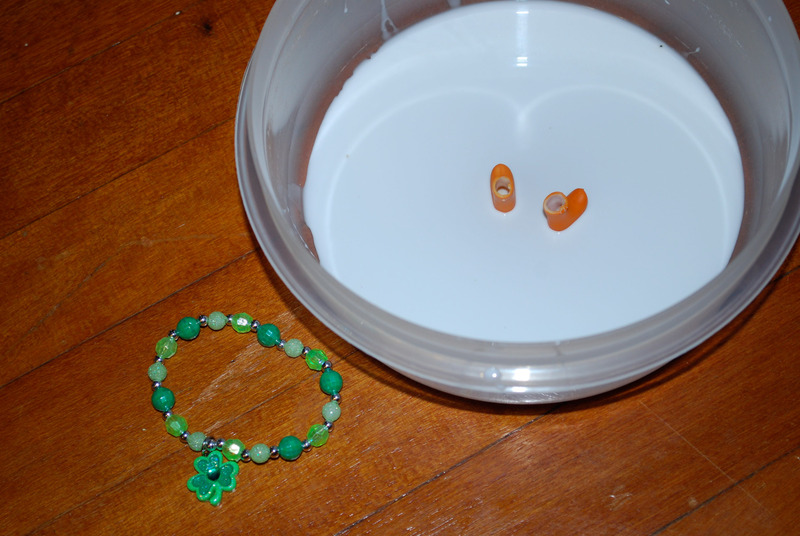 The leprechaun lost his boots in the glue and left a St. Patrick’s Day bracelet! Long story short: We ended up purchasing all three of your eBooks on iTunes. 🙂 Thought you would like to know! Awesome! So glad it worked out and they got there in time, since we live in Hawaii. Can’t wait to tell my kids! This entry was posted on March 4, 2015 by mdaucello in Ebooks, Elves and Leprechauns, Leprechaun Adventures, St. Patrick's Day and tagged book, children, e book, ebook, ipad, Irish, kids, leprechaun, mischief, photographs, photos, picture book, pictures, preschool, read aloud, school, St. Patrick's Day, story, trap, trick.